Marple Santa Dash is now open for Registration! This year the 10th annual Romiley & Marple Lions Santa Run is taking place in aid of Kidneys for Life on Sunday 2nd December. Marple Santa Dash is a fun run for all the family starting at 12 noon from Marple Memorial Park. The event finishes at Marple Garden Centre, where you will be greeted with a free mince pie and a cup of tea. Children will receive a present from Santa and everyone wearing a Santa Suit will get a free ride on the Dragon Miniature Railway. Transport is provided back to the Memorial Park. Registration is £10 for both Adults & Children which includes your Santa suit. Organisers are asking adults to raise minimum sponsorship of £30 and for the children to raise as much as they can. Alternatively download an application form here. 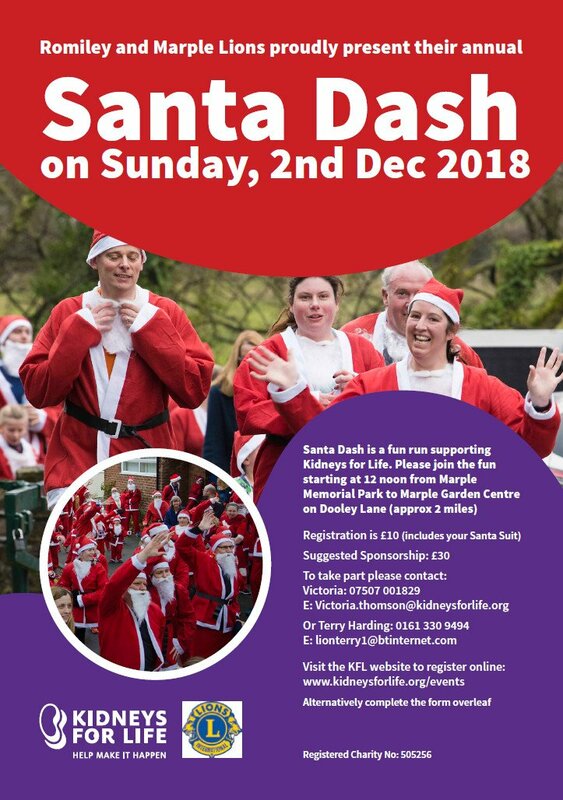 In addition to the Santa Dash, Romiley and Marple Lions will also be bringing Father Christmas to the Dragon Miniature Railway (Marple/Wyevale Garden Centre) at 11am on Saturday, 24th November and the Railway's Grotto will then be open every week-end up to Christmas and probably during the week immediately before Christmas. Visits to Father Christmas in the Dragon Miniature Railway's Grotto DO NOT NEED TO BE BOOKED IN ADVANCE. The Marple/Wyevale Garden Centre is taking bookings for Breakfast and Tea in the Restaurant with Father Christmas, starting on Friday, 30th November, so please contact the Garden Centre (0161 427 7211) as soon as possible for further details of this, as several of these sessions are already fully booked. Many thanks to all the people who have given the Lions such wonderful support over many years. We hope to see them all again this year! Save the Date for Marple Santa Dash 2018!